a freaky transforming monkey spider bot. dot which is a planet, what actually will we get from that image? What resolution will it be? Will it be a few pixels or will we see it in great detail? What we'll see is a dot of light completely unresolved. we'll know its separation from the star. of chemicals on the planet. perhaps methane, so signs of life. Indications that this might be a planet that supports life. which come out here as well? up there in the black. going to fly this into position to block the light from the star? What if you then want to look at another star? to go across the galaxy? There are two ways we can do it. or you can move the telescope to reposition. And how long would it take to move? depending on the next target. in to that problem to solve it. And isn't that a great motto for life? The rover weighed 900 kilograms, as much as a full grown giraffe. Meet Super Ball, a tensgrity robot in development in Nasa Ames. riding over obstacles and up and down hills. If it bumps into anything solid, it will just bounce back. all of our limbs can be used for either mobility or manipulation. in an environment like zero G where you don't want to float off. together that tell the robot a few things. once we are already out in space. and hydrogen to make fuel and go other places beyond the moon? that is on the horizon? For a long time now we had robots do exploration. We have rovers on Mars, they are still functioning today. perhaps just in support of humans. Hello and welcome to the Week in Tech. Plus, help could be at hand for forgetful Apple Airpod owners. Apple has created a find Airpods feature for its wireless earbuds. It works in the same way as the Find My Phone feature. of the sofa it will lead to. Plus, authorities in Dubai showed off a new way of fighting fires. response and a jet pack for some elevated extinguishing. and then hose them down. Next, never get off the boat. with any colour space suit they like as long as it is in white. These are lighter and easier to move in. Up on the International Space Station, resources are pretty tight. you might think that power at least might be plentiful. solar arrays degrade and produce less power. power anyway from bigger and bigger panels. it has eight solar arrays. as we discovered with the star shade, you have to fold it up. is mounted on a thick protective aluminium backing. the more you increase the thickness. is working on a solution. about how light it is. It looks quite thick but it's so light. so it has to be light. To make sure the cells did not crack when you're launching in space. It's really violent when it goes in space and on a rocket itself. and I guess the unfurling that can damage these things? But this is not good enough for you! It feels like a bit of plastic. whether it is space travel or satellites? in a small area itself, so you don't need all these things. but for the next best thing, why not try it in VR? I'm now looking at Vancouver apparently. there were the usual challenges faced by those producing VR content. decision to be moved, it can be very disorientating. and cares is not one jot for the way that we've chosen to live. itself as a churning, raging ball of fire. as a coronal mass ejection. 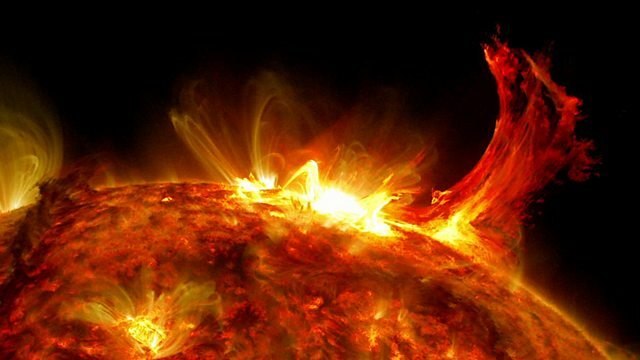 So this is a coronal mass ejection in close-up? This is what astrophysics does. how fast they move, how hot they are, how dense they are. Have we ever been hit by one of those? The Earth has been hit by one of those, yes, many times. looks quite final to me! The Earth is about this size. and then we get a lot of these. This is what we call space winter. Which I guess makes Bart De Pontieu a space weatherman. which looks at small parts of the sun in great detail. ejections will affect us on Earth. You can see in this movie when that eruption happens. You see all that snow on the image. our CCDs and they leave charges in there. Satellites have gotten lost as a result. And so when these things happen, you can go in safe mode. If you can predict them properly, you can go in safe mode. grids getting overloaded and transformers blowing up. because the atmosphere is disturbed that day. preview of how they were testing it. tube, you can see me. Of course, you don't really want to see me or just the blue sky. into a relatively tiny space. help us to unlock the secrets of our nearest star. the University of Oslo in Norway. and how we could possibly predict things like this. because I want a copy of that!